Herbert Green came from a humble background but rose to become headmaster of a school in Eastbourne. He was one of four Sussex freemasons who lost their lives while serving with the Royal Sussex Regiment. Herbert Williams Green was born on 3 December 1882 at West End, Bruton in Somerset, the seventh of nine children born to William Green (1845–1886) and his wife Sarah Ann née Williams (1849–1938). William Green was a carpenter by trade and had married Sarah at Exeter in 1869, following which they had a child about once every two years. Herbert took his second name from his mother’s surname – in many records he is shown incorrectly as Herbert William Green. Herbert was baptised at St Mary’s Church, Bruton on 10 January 1883, by Revd. Henry Thomas Ridley. Herbert’s parents continued to live at Bruton until his father died in September 1886, aged 41. At the time of the 1891 census, Herbert was living with his mother’s sister Hannah (a grocer & draper) at Main Street, Everdon in Northamptonshire. Hannah’s neighbour was another sister, Elizabeth Wright, now a widow. Hannah was married to Heinrich Müller, a German musician, who, at the time of the census, was living in the home of another German musician, Jacob Geis and his family, together with another nine musicians from Germany, at Sandhill Road, Tormoham (now part of Torquay) in Devon. Ten years later, Herbert was still living with Hannah and Heinrich Müller, but the couple had moved to Hatfield Place, Tormoham. Herbert, now aged 18, was described on the census as a “4th year PT in Elementary School”. On 7 April 1902, Herbert’s mother Sarah remarried to widower George Stanton, originally from Northamptonshire, at Christ Church in Sparkbrook, to the south of Birmingham. After their marriage, the couple lived at Sherifoot Lane, Four Oaks in Sutton Coldfield from where George worked as a jobbing gardener. In September 1907, Herbert (aged 24) was appointed headmaster at St Mary’s Boys’ School in Green Street, Eastbourne, a post he retained until his death in 1917. (In 1972, the school merged with the local girls’ school as Ocklynge Junior School on a new site at Victoria Drive.) Herbert now lived with John Smallbone and his family at “Fulford”, Motcombe Road, a short distance from the school. Herbert was initiated into Anderida Lodge No 2434 at Eastbourne on 18 December 1907, was passed on 15 January 1908 and raised as a master mason on 10 February. He subsequently became Worshipful Master of the lodge. On 30 December 1912, he was a joining member of another Eastbourne lodge, Tyrian Lodge No 1110. His address was recorded in the lodge records as 25 Vicarage Road, Eastbourne. He was immediately appointed lodge organist, an office he held until his death in 1917. At Eastbourne, on 10 December 1915, Herbert enlisted as a private into the Inns of Court Officer Training Corps with service number 8790. The Inns of Court OTC had originally restricted itself to recruiting from lawyers but by 1915 was on a recruitment drive to replace men who had been killed. Herbert spent a year with the OTC primarily at their training depot at Berkhamsted, where the subjects covered included drill, firearms, entrenching, map reading, field exercises and lectures, on a diverse range of subjects from sanitation, through tactics, to the history of the war. Herbert was appointed lance corporal on 19 August 1916 and promoted to corporal on 2 September. On 30 October, he joined No 14 Officer Cadet Battalion and was commissioned as a 2nd lieutenant in the 1/5th (Cinque Ports) Battalion of the Royal Sussex Regiment on 25 January 1917. He was immediately sent to France to join his battalion, part of the 48th (South Midland) Division, and his first major engagement was in the pursuit of the German retreat to the Hindenburg Line from 14 March to 5 April 1917, including the occupation of Peronne on 18 March. In the summer of 1917, the battalion were moved to Belgium. At the end of July, the allies launched a major offensive known as the Third Battle of Ypres, or simply as Passchendaele, after the village that saw the heaviest fighting. On 16 August, British troops attacked at Langemarck, to the west of Passchendaele, eventually capturing the village from the Germans after four days of heavy fighting, involving a great loss of life. 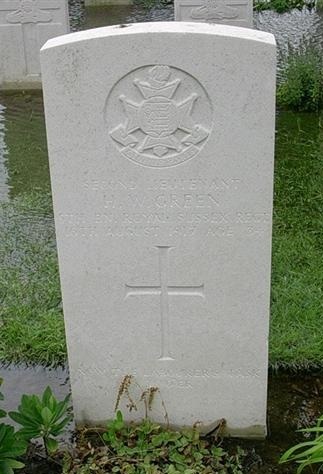 Lieutenant Herbert Green was killed on the first day of fighting at Langemarck together with four of his men. Also killed that day was Captain Cecil Langham, the son of the Battalion Commander, Colonel Frederick Langham. Herbert was buried at Vlamertinghe New Military Cemetery (in Plot VIII. E.5) alongside Captain Langham. He is commemorated on the war memorial in Eastbourne Town Hall, and also on the war memorial at Royal Sutton Coldfield, close to the home of his mother. He was awarded the British War Medal and the Victory Medal. In his will, he requested that his medals and any other “mementoes” should be sent to the managers of St Mary’s Boys’ School, Eastbourne. Herbert’s younger brother Tom (born 1885) was also killed in the war. He was a private in the 25th Battalion of The King’s (Liverpool Regiment) and was killed on 2 October 1918. He is commemorated on the Loos Memorial and also on the memorial at Royal Sutton Coldfield. Two other brothers also served in the army, but survived the war. Edmund (born 1879) served as a driver with the Army Service Corps, while the youngest member of the family, Frederick (born 1886), was a lance corporal in the Duke of Cornwall’s Light Infantry and later in the Machine Gun Corps. White, Roger (June 2016): A History of Tyrian Lodge No 1110.